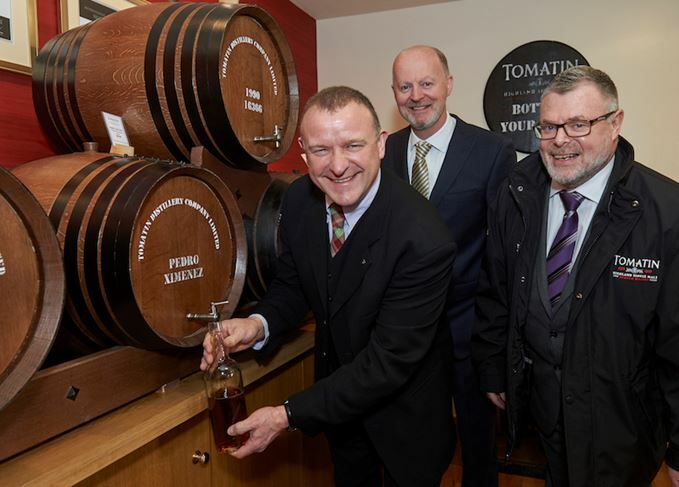 Highland distillery Tomatin is planning further investment in its tourism facilities following a 40% increase in visitor numbers. Tomatin announced plans to make a new film about the distillery and the people living there after a 50% rise in tourism turnover to £580,000, which followed previous improvements to visitor facilities. The announcement coincided with last week’s visit of local Inverness MP, Drew Hendry, during which he had an in-depth tour of the Japanese-owned distillery, including a concluding dram of whisky. Tomatin is unusual in being a distillery-based community: some 80% of employees live on-site in 30 distillery houses. ‘Our community lies at the heart of everything we do, and the world-class product we are offering is testament to the respect for tradition, dedication, skill and attention to detail of our craftsmen,’ said distillery general manager Graham Eunson.